April 7, 2016 – Collectors who have been on the fence about joining the American Numismatic Association now have an additional reason to sign up. The ANA is offering a limited-edition Mint State (MS)-69 American Silver Eagle for new members who join at the Platinum level. 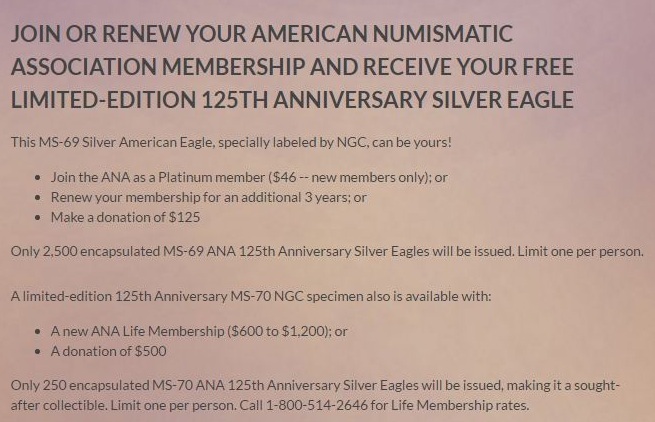 The Silver Eagle premium, specially labeled by Numismatic Guaranty Corporation (NGC) for the ANA’s 125th anniversary, is also available to current members who renew for an additional three years. Only 2,500 of the encapsulated MS-69 ANA 125th Anniversary Silver Eagles will be issued. A limited-edition 125th anniversary MS-70 NGC specimen also is available with a new ANA life membership ($600 to $1,200). Only 250 will be issued, making it a soughtafter collectible. 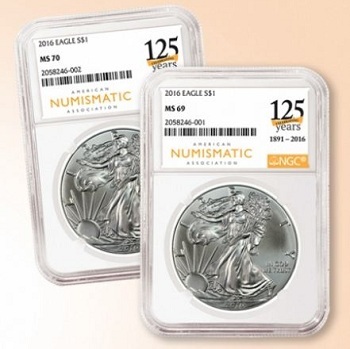 The Silver Eagle premium offered in the ANA membership drive is made possible through the support of NGC, Minshull Trading, Heartland Precious Metals, Universal Coin & Bullion, Kagin’s Inc., Mid-American Rare Coin, and Monaco Rare Coins. The American Numismatic Association, the largest nonprofit organization in the world dedicated to encouraging the study and collection of coins and related items, provides its 25,000 members access to the best educational programs in the hobby – seminars, lectures, correspondence courses, a numismatic lending library – plus the opportunity to engage with like-minded collectors at two annual conventions. The ANA’s monthly magazine, The Numismatist, remains the gold standard of hobby publications and features lavishly illustrated articles written by leading numismatic experts. In December 2015, the ANA digitized all 128 volumes of the magazine, from 1888 to the present, allowing members to experience The Numismatist in its historical context free of charge.